Represents a merger between the Neolithic agricultural society derived form the LBK culture and Mesolithic (hunter-gatherer) lifestyle, in southern Scandinavia, the Netherlands, northern Germany and Poland. The culture owes its name to the distictive collared flask ceramic, perhaps a precursor of the Bell-beaker ceramic that would spread across the western half of Europe from 2800 BCE. Neolithic agricultural economy dominated by animal husbandry of sheep, cattle, pigs and goats that grazed in a demarcated piece of land around the farmers' houses. Cow milk was consumed and oxen were used for heavy work. TRB people also complemented their diet through hunting and fishing. Primitive wheat and barley was grown on small patches that were quickly depleted. Flintstone was mined, notably in southern Sweden, to make flint axes. Copper daggers and axes were imported from Central Europe. People lived in wooden longhouses with clay walls and thatched roofs. They were centered around a monumental grave, which acted as a symbol of social cohesion. Villages were located close to those of the preceding Mesolithic Ertebølle culture, near the coastline. Marks the appearance of Megalithic tombs and passage graves (from 3,400 BCE in Denmark) along the coasts of the North Sea and the Baltic Sea, apparently as an eastward expansion of the Atlantic Megalithic cultures, with which it was later unified within the Bell-Beaker trading network. Hundreds of megaliths have been uncovered, with particularly high concentrations in the Dutch provinces of Gelderland and Overijssel, in the Lüneburg Heath in Lower Saxony, around Haldensleben in Saxony-Anhalt, and on the island of Rügen in Mecklenburg-Vorpommern. Burials included ceramic vessels that contained food, amber jewelery and flint axes. Funnel-beaker people reached a height of 165 cm for men and 153 cm for women in average. They rarely lived over 35 or 40 years old. Variants of the Funnelbeaker culture in or near the Elbe catchment area include the Tiefstich pottery group in northern Germany as well as the Baalberge group (TRB-MES II and III; MES = Mittelelbe-Saale), the Salzmünde group and Walternienburg-Bernburg group (all TRB-MES IV) in Saxony-Anhalt. The following mtDNA samples were tested by Brandt et al. (2013), Brotherton et al. (2013), Malmström et al. (2015) and Fraser et al. (2017). No Y-chromosomal DNA from the Funnelbeaker itself has been tested to date. The following samples are from the related Baalberge and Salzmünde cultures in central-east Germany, but may not necessarily reflect the paternal lineages found in Scandinavia and northern Germany at the time. Indeed the mtDNA of these various groups displays considerable differences. 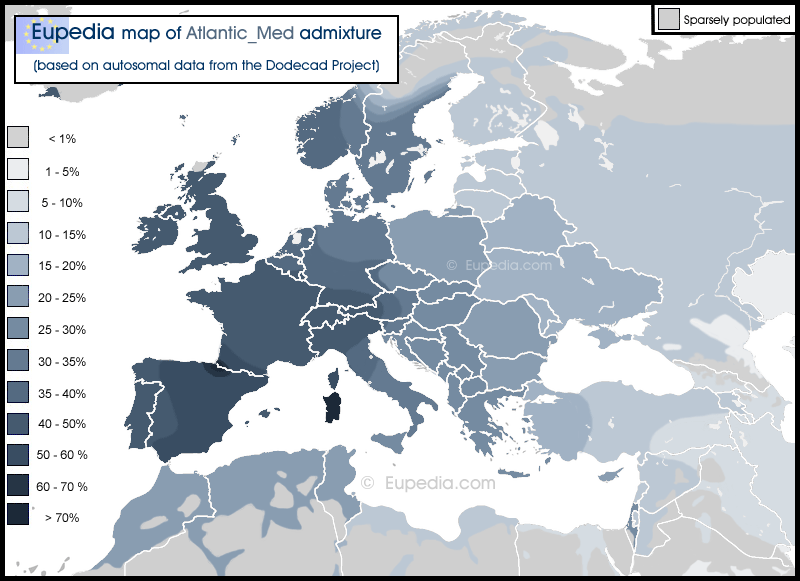 The analysis of two Funnelbeaker genomes from circa 3000 BCE using the Dodecad K12b calculator shows that they possessed over 60% of Atlantic_Med admxiture, more than any modern population except the Basques and the Sardinians, two populations with high Neolithic ancestry. This admixture is strongly reminiscent of the extent of the Atlantic Megalithic cultures. The Dodecad K12 calculator revealed a considerable amount of African admixture, which came as a big surprise since no African admixture is found in Scandinavia today. The two Funnelbeaker samples from Sweden tested below, display about 6% and 11% of African admixture respectively. How it got there is still a matter for debate, but the most likely explanation is that it came with Megalithic people from Iberia, who in turn inherited North African admixture from South Levantine Neolithic farmers who reached Iberia via North Africa. Remnants of this African DNA were found in every prehistoric sample in Scandinavia from the Chalcolithic until the Late Iron Age, as well as among the Anglo-Saxons. 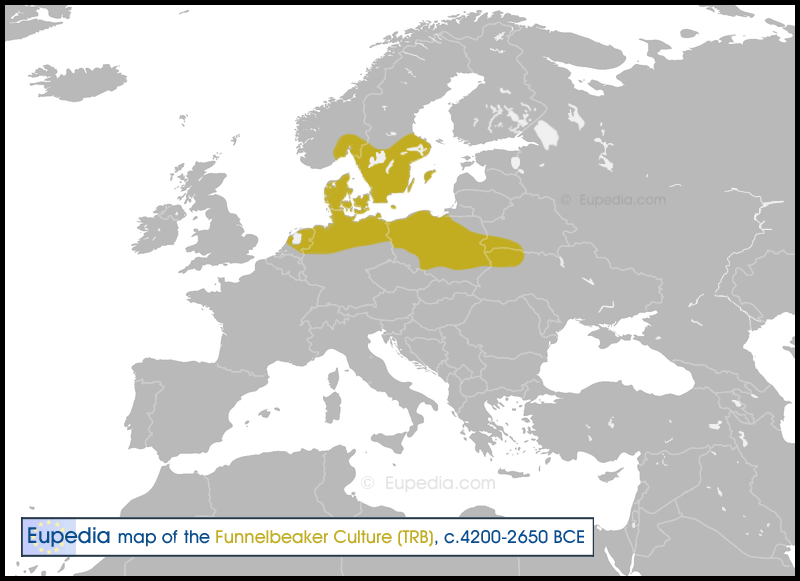 The Funnelbeaker culture indeed marks the arrival of Megalithic structures in Scandinavia from western Europe. Megaliths seem to have originated in the Near East. The oldest ones in Europe were found in Sicily and southern Portugal and date from c. 7000 BCE. The Atlantic Megalithic culture really started with the advent of farming and would have spread from Iberia to France, the British Isles and the Low Countries before reaching Scandinavia. Considering the high Northwest African admixture in Funnelbeaker, there is a good chance that Iberian Megalithic people inherited genes from Northwest Africans, probably from the North African Neolithic route that brought R1b-V88, E-M78, J1 and T1a to Iberia. 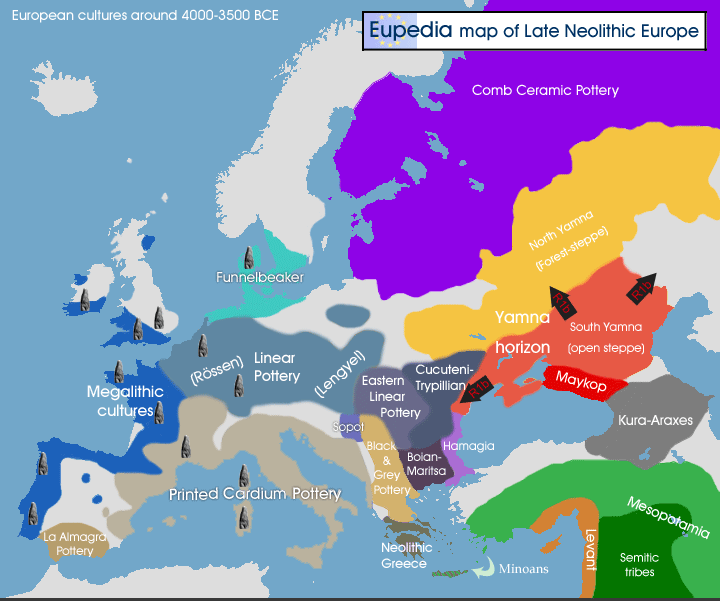 R1b-V88 and E-M78 (V13) have both been found in Early Neolithic Iberia, and are both found throughout western Europe today. The two samples below also caried about 3% of Southwest Asian admxiture, which is perfectly consistent with a Neolithic dispersal from the southern Levant across North Africa until Iberia.